Modern cars have increasingly more in-car electronics which drain the battery fast during frequent demonstrations at show room and car shows. 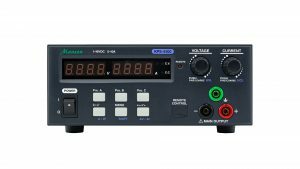 Model ZPS-9160 is designed to supply sufficient DC power to ensure smooth demonstrations or try outs by visitors. The DC Supply mode has sufficient DC power during the flashing (updating) of the car’s MUC . The slim casing and low profile design allow the unit be placed under most cars without undue attractions. In charger mode, it provides refreshing charges to LEAD, AGM, LiFePO4 and maintains the car’s battery in good condition before hand over. Slim low profile metal casing fits well under most cars. – High output power with adjustable voltage and current with 5 selections of lengths of connector cable to ensure continuous presentation of showroom cars. Input Under Voltage Protection, Input/ Output Wrong Polaritybackup DC power for flashing car’s MCU. Charger Mode with battery type selection and adjustable max current & cable length selection allows refresh complete charge to car battery before handover. Selection of cable length setting for both power supply & charger mode to ensure precise voltage at battery terminal. 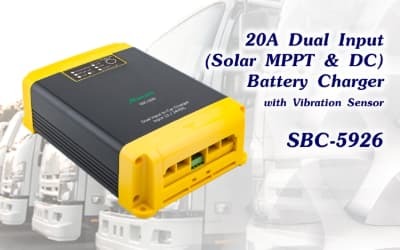 A high power smart charger designed for fast & safe charging of Lead Acid and LiFePO4 batteries with optional WiFi connectivity for remote monitoring of charging status of battery. The advanced Micro-processor control allow specific charging profile for Lead, AGM and LiFePO4 battery from 16AH to 200AH. There is a WiFi version of same charger to allow for remote monitoring of charging status of battery on smart phones. Microprocessor Control with different charging & maintenance profiles for Lead Acid based & LiFePO4 battery. One button selection of battery types then set and forget operation. Thermal control regulates charging current in hot or enclosed condition. Charger can be connected for long period of time to battery without overcharging. Special charging profile for LiFePO4 battery: soft-bulk, bulk then free float stage. No auto-repair. Initial qualifying checks, auto-repair, soft-bulk, bulk, pulse absorption, free float stages. Suitable for car & deep cycle type battery from 16Ah to 180Ah. Maximum 8 hour pulsing repair charging for suphated and deeply depleted lead acid based battery. Supplied with 2 exchangeable leads with clamps & eyelet terminals. Reverse Polarity & Short Circuit Protection with warning LED, charger returns to normal when fault is cleared. Over Voltage Protection- Charger will shut down when output senses higher than 16.5V & charger recovers when fault disappears. Maximum repair charge period is 8 hours and charger will indicate battery is defective. Auto shut down when Bulk & Absorption charge is over 40 hours to avoid waste of energy on defective battery. Convection cooled with thermal regulation to lower the charging current till unit’s temperature drops. In the event of persistent rising temperature, charger will shut down its output with warning led. 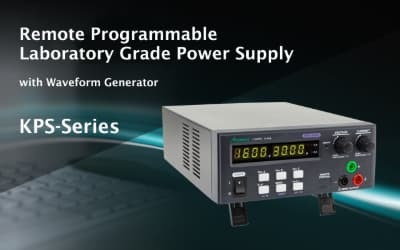 This KPS series of switching mode remote programming power supplies provide power test wave forms from the versatile 10 Step generator which can simulate common test conditions for electronic devices. 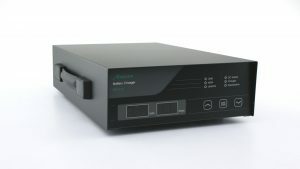 In addition to the supplied USB communication interface, an optional Ethernet interface card allows users to configure, control, or monitor basic power supply settings over the internet. KPS uses SCPI (Standard Commands of Programmable Instruments) syntax for easy system integration with test equipment. 4-digits display provide 10mV and 10mA resolution. Three user adjustable presets of voltage and current values can be saved for quick recall from the front panel buttons. User adjustable upper voltage and current limits make it extra safe for delicate and sensitive test piece. Output On-Off button and the Key Lock button allow safe and convenient operation. Analogue Remote Control of voltage, current and Output On-Off provide additional flexibility in the control of the power supply. It is ideal for laboratory, university, work shop, production, quality control and advanced DIY applications. This family of KPS laboratory programmable power supplies has 5 series: 180W, 360W, 480W, 640W and 960W. All have 4 digit voltage and current LCD displays starting from min. 1V and zero Amp. Resolutions: 10mV and 10mA. Universal input for low power models. Remote Programmable via USB or LAN(with optional LAN Card). On housing 10 Steps Waveform generator with cycle periods running. 4 digits Voltmeter and Ammeter. 3 user defined V & I panel presets for frequent use. User adjustable upper voltage and current limits. Output On-Off and Key Lock button. Standard Commands of Programmable Instruments (SCPI) command syntax. Analogue Remote Control of V, I & output On-Off without computer. Rotary encoder knob with definitive action of fine and coarse tuning. Smart cooling fan speed control from zero to full speed. Self diagnostic check on LED display and cooling fan on start up. 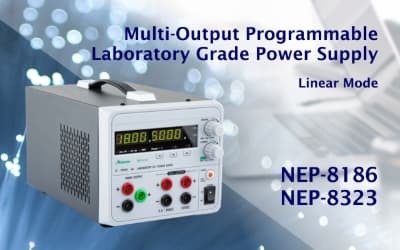 Isolated ground , Active PFC & high power efficiency. Over load, Tracking Over Voltage Protections. 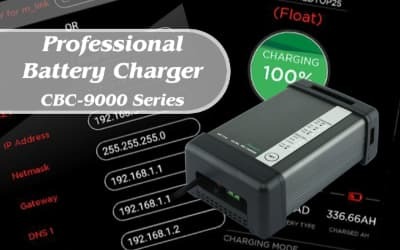 This pro charger is designed for applications that demand adaptive charging for Lead Acid based and LiFePO4 (LFP) batteries. Battery with and without load can be connected to the charger all the time and the charger will keep on monitoring the battery. When battery is deeply depleted (battery voltage is less than 12V) soft-start charging is activated with half rated charging current until battery voltage rises to 12.4V then normal bulk charge with full current will kick in. Both soft-start and bulk charges are in constant current without exerting high voltage to the battery. 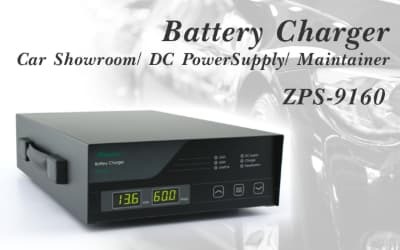 When the battery voltage rises to a preset value then constant voltage charge occurs with decreasing current which leads float charging with lower constant voltage to keep the battery ready and light refill for any self-discharge or light load. The charger will enter into an energy conversation (Standby) stage with lower Float Voltage after long period of inactivity of 8 hours or more has been detected. This Standby stage also helps to reduce grid corrosion. Charger will automatically give a refreshing cycle charge (fast bulk & absorption, float) at 7 days interval of inactivity. This is to keep the electrolyte and the cells of the lead acid battery in good working condition. There is a manual equalization mode for lead acid batteries either in plate or cylindrical cells subject to the recommendation of manufacturer. There is a special charge algorithm and treatment for Lithium Ion Phosphate (LFP) batteries to ensure safe and optimal charging adaptive to the special chemistry of the battery which is quite different to Lead Acid battery. There are only two active charging stages namely Bulk and Absorption, at the end of Absorption is the inactive (no charging current) Standby Stage. There is no Float and no automatic refreshing cycle charge for LFP. A load can be connected to the battery during charging as long as the load is not larger than the rated output of the charger. The charger can be used to power up dc load when not connected to battery. The charger is housed in a robust anodized Aluminum body completed with Poly carbonate end caps. Front Exhaust design with temperature control variable speed fan for cool and quite operation. 8 hour sleep Mode or the Half Power Mode with half power presents noiseless operation. 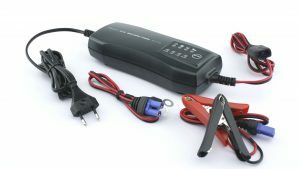 When connected to the supplied battery temperature sensor, the charging voltages changes with the battery temperature such that charging voltage decreases with rise of temperature and increases with drop of battery temperature. When battery temperature is over 60B0C, the charger will shut down. 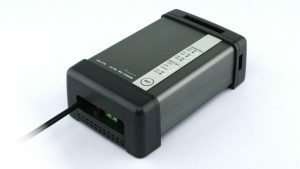 At high operating temperature charger will gradually decreases the output power to protect the electronic components from further thermal stress and at the same time keeps a safe and continuous charging until the high limiting temperature 60B0C is reached, charger will then shut down and self restart when charger cools down. Output reversed polarity protection with thermal fuse. 7 LED with 4 dual mode plus 3 for indications of charging status and battery selection.